The Packard hotel, though currently not under construction, has fully detailed floor plans and structure plans drawn out. The plans seek to integrate the Hotel’s original and authentic Cuban features with a chic, classical, contemporary five star hotel design and amenities. The design incorporates the Museum of Cuban Music History, a performance and practice facility for music, as well as a two story jazz club on the corner of the site. Along with musical benefits, the Packard will also house retail spaces, a world class restaurant, performance spaces, exhibition spaces, spas, roof top swimming pools, music gardens and conference rooms. The hotel will consist of 300 rooms, making it one of Havana’s biggest hotels. The three types of rooms available shall be: one bedroom loft style rooms, two bedroom apartments and one bedroom, one level apartments. Each room will feature a front and back porch, one of the signature elements of the Hotel’s design. Located in Old Havana, the Packard invites clients to discover the rich colonial past of Havana and delve into the development and transition of the country from the Pearl of the Spanish Empire to the Revolutionary State of Cuba. Facing the Paseo del Prado (the most important boulevard in Old Havana) and backing out onto the Havana Bay, looking out at the Forteleza in the distance, the location of the Packard could not be more poignant. Furthermore, clients get the opportunity to enjoy the beauty of Havana from the bedroom windows. Currently occupied by viney trees and plants, carefully wrapping themselves around the beautiful scaffolding, the Hotel Packard still reflects the splendour of it’s time, combined with the slowly decaying charm of Old Havana. Over the past two decades, the Hotel Packard has lain in ruins in Old Havana, the glorious facade reflecting the grandeur that used to exist in place of the shell of such a magnificent structure. 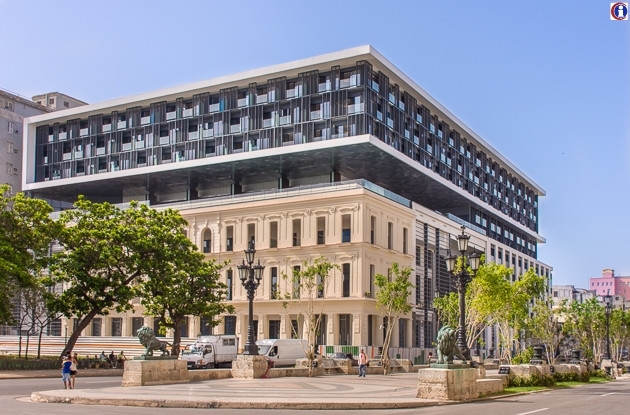 The structure, seen as one of Havana’s most important, was given a new lease of life by the two Spanish architects Oscar Garcia and Teresa Luis from the years 1997 to 2003. The Hotel Packard will be re-developed by Spanish 5 stars hotels company Iberostar. The city will be working with architect Rafael Moneo to restore the 1920s building to it’s former beauty. Construction of the building has still not commenced, though plans are underway to get the project started within the next year.